Colin Murray Cowherd is a famous sportscaster currently working for Fox Sports. Known for his appearance in The Herd with Colin Cowherd, the famous media personality is working for the show since 2001. He has worked for ESPN radio and hosted the sports show SportsNation. Other than working for Fox Sports Radio and Fox Sports 1, he also hosts shows like Speak for Yourself along with Jason Whitlock. The resident of Los Angeles, California, Cowherd reportedly earns around $6 million, as his yearly salary from the Fox Sports network, and as of 2018, he reportedly has an estimated net worth of over $14 million. He has been married to Ann Cowherd, since 2000. Previously, he was married to Kimberly Ann Vadala, a former model and has two children with her. Colin divorced Vadala in 2007. Colin Murray Cowherd was born on January 6, 1964, in Aberdeen, Washington, U.S. to father Charles Cowherd and mother Patricia Cowherd. He holds an American nationality and belongs to White ethnic group. Further, he grew up with his older sister Marlene Cowherd in Grayland, Washington. After completing his high school, Cowherd joined the Eastern Washington University, where he used to listen and practice the baseball game announcing. Colin Cowherd is one of the most popular Fox Sports radio/television host who made a successful career as a sportscaster. The reported average salary for Fox Sports as of 2018 is estimated to be in the range of $40,000-$1 million. As Cowherd is an experienced host and play-by-play announcer, he has generated a lot of incomes displaying his charismatic talents. In 2015, he joined Fox Sports Network with $6 million in annual salary for the period of 4 months. The American sportscaster/media personality, Colin Cowherd has an estimated net worth of $14 million. As of 2018, he receives an annual salary of $6 million from his successful reporting career and a share of the net revenue from the show. Further, the talented host receives an added sum of money from his radio and TV guest appearances as a sports pundit too. 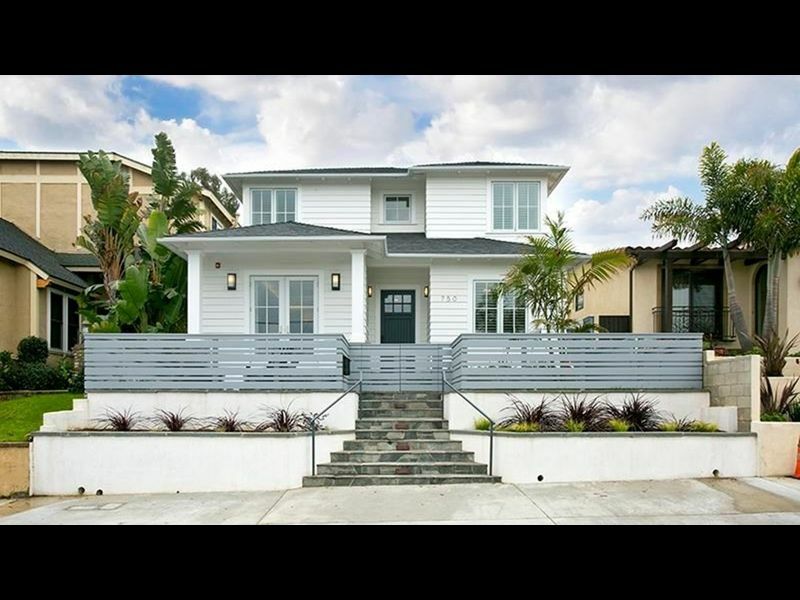 During 2015, Cowherd bought two luxurious homes in the Manhattan Beach area for $4 million and $3.1 million respectively. Later, in 2018, Cowherd sold one of his houses(3,700 square foot) for $3.25 million. Cowherd currently, lives in Los Angeles, California, along with his family, in another house which he is planning to sell at $4.25 million. As per reports, he has another home in western state Utah. Cowherd began his career as the play-by-play voice for an American baseball team San Diego Padres. Later, he served as a sports director at NBC affiliated channel KVBC in Las Vegas, Nevada, where he was named "Nevada's Sportscaster of the Year" five times. In addition, he was named the Sports Illustrated's 2005 Radio Personality of the year. Later, he served as weekend sports anchor at WTVT tv station in Tampa, Florida. In 1996, he moved to Portland, Oregon where he worked as a sports anchorman for another NBC digital channel KGW-TV. In 2001, he hosted the morning time show "The Herd" on all-sports radio KFXX. Later, in 2003, he was selected to host the late morning time show on ESPN Radio replacing Tony Kornheiser. In addition, during 2009-2012, Cowherd along with Michelle Beadle and Charissa Thompson served as a co-host of the ESPN2 show "SportsNation". His dedication led him to the Best Pundit of 2012 by PunditTracker. 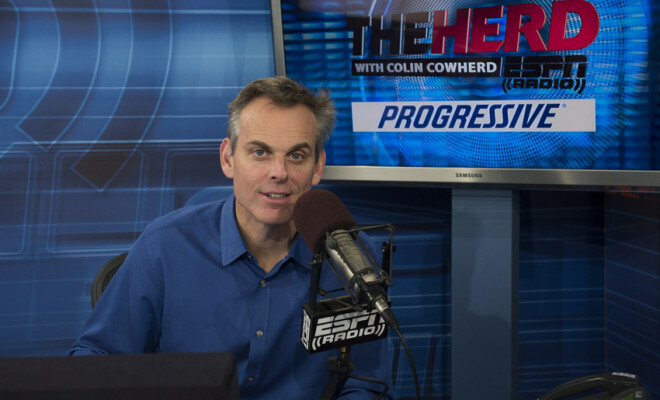 Later in 2013, Cowherd began hosting the ESPN Sunday morning pro and college football talk show Colin's New Football Show. On July 16, 2015, Cowherd officially announced his retirement with ESPN. Network president John Skipper stated his presence was "mutually beneficial". Later on August 12, 2015, Cowherd officially signed a four-year deal with Fox Sports. He hosted show named "The Herd", which moved to Premiere Networks and Fox Sports Radio on September 8, 2015. Cowherd was accompanied by Kristine Leahy, another co-host and newswoman. Cowherd also served as the co-host on the daily sports talk show "Speak for Yourself with Cowherd & Whitlock" on Fox Sports 1 along with his co-worker Jason Whitlock. Currently, Cowherd is the host of the popular sports talk show "The Herd with Colin Cowherd" on Fox Sports Network. Regarding his personal life, Cowherd is 54 years as of 2018. Further, his star sign is Capricorn. The talented sports media personality, Cowherd has married twice during 1996-2010. He married his first wife Kimberly Ann Vadala, a former stunning model in 1996. For more than 11 years they enjoyed their relationship. With Vadala, he has two children; one son and a daughter who are under Kimberly's custody after the couple broke up in 2007. "We went out to dinner – he introduced me to my wife on this night – and we got comped at Benihana because the maitre d’ knew Colin." Details about her previous affair and husband name is unknown but Ann has four children from her previous marriage. Colin and Ann together donot have any children but Colin is father of 6 including Ann's 4 and 2 from his previous wife.